The .xip format is a version of the RAR compression method, but with the addition of allowing for "digital signatures" like those found in files downloaded from the App Store. 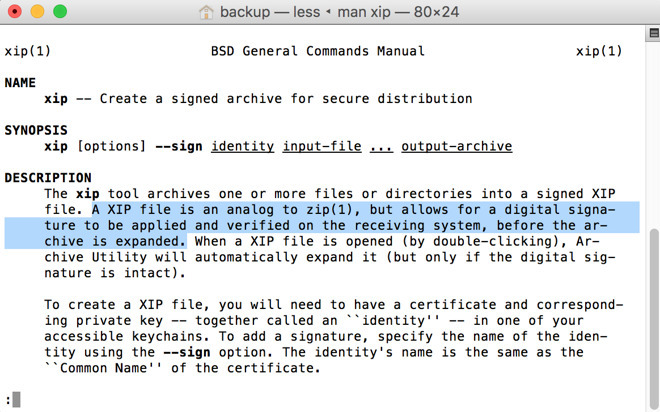 As discussed in the "man" page, accessible from the Terminal, "A XIP file is an analog to zip, but allows for a digital signature to be applied and verified on the receiving system, before the archive is expanded." Apple's Archive Utility, included by default in macOS, handles the archives with no other user action needed. The file format itself has been supported since OS X 10.6. Partially as a result of the shift, the decompression process is taking significantly more time than previous versions with some users reporting up to 30 minutes to install the new Xcode beta following download. AppleInsider testing showed 21 minutes to decompress the file on a 2012 i7 Retina MacBook Pro, and 31 minutes on a 2012 i7 Mac mini with SATA SSD upgrade. A previous version of Xcode compressed in .zip format took eight minutes to decompress on the same Mac mini, but lacked the security features inherent in the .xip file. Previous Xcode beta releases have been distributed in Apple's .dmg format, or a .zip file. Where both the .zip and .dmg files have rudimentary checksums to warn the user that it may have been corrupted in transit, there are no safeguards against tampering. While there appears to be a higher than normal incidence of decompression problems with the .xip files, there are fixes. The most effective fix is a reinstallation of OS X 10.11.5 or the macOS 10.12 beta from the recovery partition. Other users are turning to disabling the signature check in the Terminal, defeating the purpose of distribution in .xip format. Apple's move to the .xip format for Xcode was likely made in response to 2015's "XcodeGhost" incident. In September 2015, a hacker group altered code in a privately-hosted version of Xcode, which piggybacked malware onto compiled apps, without the knowledge of the coder. All of the afflicted apps have since been purged from the App Stores. As a result of the incident, Apple started hosting Xcode on Chinese servers, to combat the tendency of developers to download from local, faster non-Apple repositories.